As we conclude this timely study of the Lord's nature, it is vital that we give a practical summary by looking at three criteria Jesus used to govern His own responses to a culture in chaos. Before responding to any situation, Jesus examined the motives, both His own and those He was engaging. In this passage, we find one of the most striking contradictions to the mild-mannered Messiah that is so often preached today. In order to fully understand and emulate the example of Christ, we must fully embrace all sides of His nature. Q: If Jesus was God in the flesh, wasn't the temple His house as well? Why did He violently defend the temple's sanctity on behalf of His Father rather than just claiming it for Himself? A: His assignment demanded more than a pursuit of personal acknowledgement. Jesus came to seek and save the lost. That process demanded a perfect example for those who would respond to His salvation. His selfless motives had to be obvious in order for His followers to react similarly. Application: From this example of cultural confrontation, we see that it is possible to react loudly and even violently yet still maintain pure motives. The proof test is found within the heart. Before every action, Christians must ask one very important question: Is this best for the cause of Christ or am I waging a personal vendetta to defend my own conclusions, my own heritage, my own pride? Many a Jewish leader fell victim to the sincerely held motives that were not in the best interest of God. It was this very thing that prompted Christ's crucifixion and the subsequent torture, imprisonment and killing of early Christians. Before cleansing any temple or crucifying anyone's character, every Christian must be sure to examine his own motives. Secondly, Christ left us an example that shouts, we must engage in judging the motives of others. In a world which hides behind the line, "Don't judge me!" it can easily be assumed that it is not our place to judge someone else's motives. But that conclusion comes from the heart of Satan, not the teachings of Christ! Perhaps the most misapplied verse in all the Bible is this, "Judge not, that ye be not judged." (Matthew 7:1, KJV) Satan has skillfully lifted these words out of context and used them to mold a generation of spineless Christians who are without evangelistic fervor because they are without an evangelistic yardstick. Read the context! Clearly, Jesus was not condemning the process of judging others. What He was doing was condemning judgments that are made with insufficient data and impure motives. Judging others is not only necessary for daily living, it is a commanded element of a Christian's function - evangelism. "Jesus entered Jericho and was passing through. A man was there by the name of Zacchaeus; he was a chief tax collector and was wealthy. He wanted to see who Jesus was, but because he was short he could not see over the crowd. So he ran ahead and climbed a sycamore- fig tree to see him, since Jesus was coming that way. From this account, we learn several obvious things that pointed toward the motives of the heart. 1. Zacchaeus was a tax collector, a chief tax collector and, as a result, he was very wealthy. At first glance, one might assume that these things would be considered evidence against pure motives. But think deeper. Why would a wealthy minion of Rome be interested in Jesus? Why would a hated sinner seek out a messenger of salvation? Read further. 2. Zacchaeus ran ahead. Clearly he had more than just a casual interest in the Lord. Is it possible that Jesus spotted Zacchaeus out of the corner of His eye and watched his feeble attempts to see over the crowd? Is it possible that Jesus took notice of his efforts and from that moment began to assess Zacchaeus' motives? Could it be that Jesus lost sight of the little man momentarily only to find him later in a place that would validate the assessment He had made about Zacchaeus' motives? 3. This wealthy government official not only ran ahead, he actually climbed a tree. Surely it would have required a certain level of humility for a man of his status to make such an undignified effort as to react like a school boy and perch himself on the limb of a tree. His motives were obvious. Application: Many of those who are counted unworthy by the religious world actually need only a moment of patient acknowledgement in order for salvation to come to their house as well. Christians must take more time to walk in the shoes of others before making harsh reactions to the path they are on. Assignment of a scarlet letter can easily snuff out a person's growing interest in the light. Watch for evidence of their motives. Those who are clearly living in open rebellion to the Creator's will should expect nothing less than open condemnation of their rebellion. But those who are straining their necks, climbing trees and making a genuine effort to find the truth deserve more than harsh reactions. The Lord would expect us to give them more than hasty assumptions and statements of condemnation that are painted with a broad brush. Cultural confrontation demands careful consideration of the motives. "...by their fruit you will recognize them." "As the time approached for him to be taken up to heaven, Jesus resolutely set out for Jerusalem. And he sent messengers on ahead, who went into a Samaritan village to get things ready for him; but the people there did not welcome him, because he was heading for Jerusalem. When the disciples James and John saw this, they asked, 'Lord, do you want us to call fire down from heaven to destroy them?' But Jesus turned and rebuked them. Then he and his disciples went to another village." Some of the best parenting advice I have ever been given came from my sister-in-law when she said, "Choose your battles wisely." Someone else has also suggested that we ask, "Is this a hill worth dying on?" Both of these statements have greatly helped me keep my perspective in times of parental stress. I believe the same advice is applicable to our study. Had Jesus used only the first key (Motives) when dealing with this Samaritan village, He most likely would have permitted James and John to bring down a fiery destruction upon that town. But Jesus, the master military tactician, understood that the mission was more important than a single battle. He rebuked His disciples for losing sight of the bigger goal. They moved on. Application: We too must be careful not to major in the minors. We must not become distracted by the need to micromanage minor skirmishes at the expense of time and energy needed to make a real difference in the outcome of the war. Jesus came to seek and save the lost. (Luke 19:10) That is the big picture. That is the battle plan. It is the war. Every cultural confrontation must be governed by what is best for the overall mission. "For though we live in the world, we do not wage war as the world does." 'Why do you call me good?' Jesus answered. 'No one is good—except God alone. You know the commandments: "You shall not murder, you shall not commit adultery, you shall not steal, you shall not give false testimony, you shall not defraud, honor your father and mother." At this the man’s face fell. He went away sad, because he had great wealth." I suppose conventional wisdom would suggest that, on this day, Jesus lost a great opportunity to gain a follower. But conventional wisdom is almost always governed by the priorities of this world. It rarely takes into account that which is of greatest importance - the soul. Please notice two phrases from this text as well as their contextual proximity to each other. First, "Jesus looked at him and loved him." Clearly, the Lord saw potential, He saw opportunity for this man to go to the next level. But secondly, it is important that we also notice the Lord's very next words, the admonishment prompted by this love - "One thing you lack...."
Conclusion: In spite of all the potential this man had, Jesus knew He needed one thing more. It was his moment. It was his opportunity to step up to the plate, see the ball and swing for the bleachers. Jesus knew the poignancy of the occasion. He understood the climactic opportunity for conviction. Because He loved him, Jesus confronted him. Because He love him, Jesus capitalized on his moment. Application: Ours is not the power to dictate a response, ours is only the power to embrace the moment. When confronting a culture in crisis or just a single member of it, Jesus requires that His followers take full advantage of the stage that has been set. Christians should never dilute the truth in a selfish attempt to manufacture a better moment. Diplomacy and grace are commanded virtues for a Christian (Colossians 4:6), but they must not be allowed to interrupt a moment of conviction. If Jesus pressed His disciples to the point of conviction, even though He knew there was the potential that they would go away sad, we must be willing to do the same. "Therefore go and make disciples.…"
The Lord of balance is calling His people into the realm of public expression. To be like Him, we must understand that He could be abrasive or He could be congenial. His response depended upon His assessment of the circumstance. As salt and light, we must be prepared to confront a culture in crisis with the same calculated approach as our Lord. Consider the motives, both yours and theirs. Keep a laser sharp focus on the mission. Take full advantage of the moment. If we will do this, the world will have no choice but to respond to HIS nature. 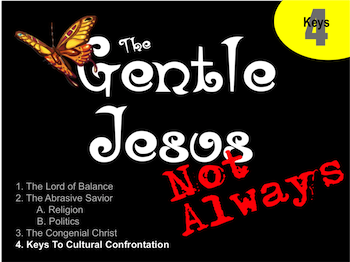 Gentle Jesus? Not always! Know Him. Be like Him. Make it real! Missed the first five lessons of this series? Take a look! Back to Top of "Keys to Cultural Confrontation"